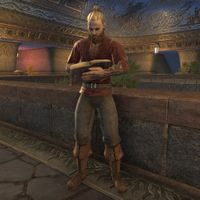 Littid is a Nord pilgrim who can be found in Saint Delyn Waistworks in Vivec City. He is always willing to talk about his dog Keba. "Keba's a good dog, but she doesn't like Baar Dau very much. Every time I take her outside she barks at the damn moonlet until her little voice gets hoarse." "Keba isn't too fond of Red Mountain. She didn't like Ash Mountain much either. I think she just has something against volcanoes. Or mountains." So you're new to Vvardenfell? "When the Pact formed I told myself it was time to visit our newfound allies. So I've been to the swamps of the lizards and the lands of the puny Elves. It's been a great journey so far, but Keba hates to travel." Why bring your dog then? "Shor's bones, you expect me to travel alone? Or worse yet, you want me to leave poor Keba with my mother? That would just be cruel. I wouldn't want to wish that on a dog. Er, you know what I mean." This page was last modified on 24 February 2019, at 00:13.